Macaroni pasta, cauliflower and spinach in our traditional creamy cheese sauce, topped with a crispy ciabatta crumb. 2. 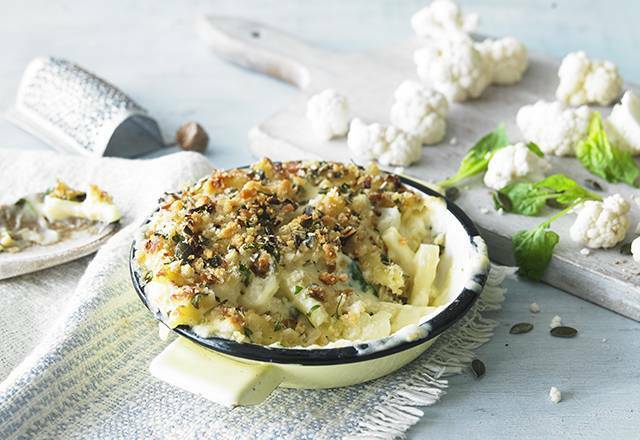 Remove the film but leave the cauliflower macaroni cheese in its wooden tray*. Place on a baking tray in the centre of the oven and cook for 35 minutes. If using a gas oven, cook for an extra 5 minutes. 3. Leave to stand for 2 minutes before serving. Make sure it’s piping hot throughout. *Our wooden trays are designed for the oven. Just make sure they aren’t placed close to any element of flame. Cream (milk), Cheddar cheese (milk), macaroni pasta (19%)(water, durum wheat, semolina), semi-skimmed milk, cauliflower (10%), white wine, mozzarella cheese (milk), fortified wheat flour (wheat flour, calcium carbonate, iron, niacin, thiamin), Regato cheese (milk), spinach, water, butter (milk), wheat flour, mustard powder, rapeseed oil, pumpkin seeds, cornflour, salt, parsley, sunflower oil, olive oil, yeast, ground white pepper, ground nutmeg, sea salt, sugar. For allergens, including cereals containing gluten see ingredients in bold. May also contain nuts, peanuts and sesame. Arrange the tomatoes on a baking sheet, cut sides up, in a single layer. Drizzle with ¼ cup of olive oil and the balsamic vinegar. Sprinkle with the garlic, sugar, 1 ½ tsp salt, and some freshly ground pepper.